All Things Considered, June 27, 2008 · The camera descends, at the start of Wall-E, from outer space to a landscape that looks eerily familiar — and sort of not. The sun filters down through a brownish haze. What seem at first like skyscrapers turn out to be neatly stacked mountains of trash. Stillness is everywhere, broken only by the unlikely sound of a song from Hello, Dolly! — and a solitary figure zipping around a junk-strewn cityscape. There's actually a nice parallel between this largely silent film and Chaplin's first sound film, Modern Times. In that one, the silent clown used the soundtrack mostly for music and effects, not for speech, just as Pixar does here. Chaplin only let you hear a human voice a couple of times, and only on some sort of mechanical contraption — say a closed circuit TV screen — to emphasize its artificiality. It was his way of saying to the sound world, "OK, everybody's doing this talking thing now, but look how much more expressive our silent world is." Though occasionally visually inventive, Kung Fu Panda is a disappointment when it comes to matters of simple black and white: the script. Everything that happens in this dull tale of Po, a paunchy panda who becomes a zealous kung fu fighter, is telegraphed well in advance. That might not have been a problem had the storytelling been more amusing. 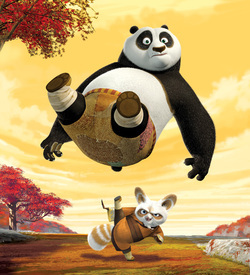 The story centers on the enthusiastic, if clumsy Po (Jack Black), a rabid armchair kung fu fan. Po's day job is to work in his family's noodle shop. When he's accidentally chosen as the kung fu master who will fulfill an ancient prophecy, he must rise to the occasion. Despite the panda being voiced by Black, the humorous moments are few. If you're going to cast someone as singularly quirky as Black, then take advantage of his eccentric persona. The role is so straightforward, it could have been played by anyone. And the supporting characters—a tiger voiced by Angelina Jolie, a crane played by David Cross, Lucy Liu as a viper and Jackie Chan as an agile monkey — are so lacking personality that you wonder why the filmmakers bothered to get such a cross section of talent. Sure, the message to believe in yourself is a valuable, if often-heard, one for young audiences. But it could have played out in a more creative way. Perhaps the most interesting character is Master Shifu, charmingly voiced by Dustin Hoffman. He whips Po into shape and reveals his own character. One sequence on a swinging wooden bridge is a visual treat, especially when seen in IMAX. But the film's climax doesn't show the fate of the bad guy. This lack of clarity might have more to do with plans for a sequel than bad storytelling. Perhaps children will be taken by Po's huggable appearance, but anyone older than 9 is likely to be bored.